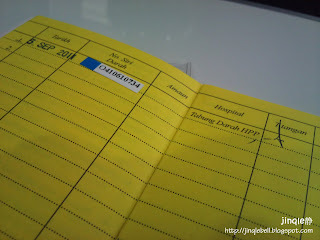 Supposed to blog this few days ago but due to my busy life + laziness,so I didn't. I signed up for this blood donation thingy few weeks ago before holidays. The blood donation thingy started from 9am to 12pm. Due to delay, I was only informed to go down after our recess, which is around 10+am. It's actually good, since i can have my breakfast first, and slowly enjoy my chemistry's free period. Went down to school hall and met some familiar faces. We were given a form to be filled up and waiting for out turn. First there's a nurse (i think she is). She will use the thing and poke a hole out of your middle finger. I thought that will be pain but suprisingly not really. She will tests out your blood type on a paper by dripping some chemicals thingy on it. Yes I'm a O+ blood person. after that, a man checked my blood pressure. After everything is done, and passed, I was given this tray of empty blood bags and others. They got this sticker, indicating which bags of blood is mine. That's all for the paper works, and check ups. First you lie down on this "bed"
You pass you tray to the person in charge, they will give you a thing..something like..ball ? then you're requested to squeeze that thing and here comes the anesthetize injection..hmm i think so ? Not that bad after all, just like normal injection. Ant bite like feeling. and then they will "poke" this 3mm needle thingy into your arm. tadaa. Let the blood flows out and you're done. In fact I'm quite excited throughout the whole process. Some experienced dizziness ,headache and even vomited. Make sure to get enough sleep and take in some food before the donation. 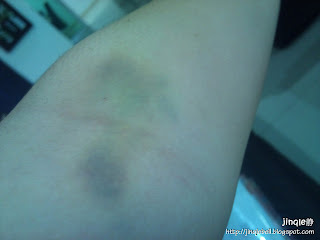 means 6days after blood donation, didn't mean to scare all but this is my conditions. noticed that there's a small needle hole slightly on the left ? I think I'm weird, everyone recovers pretty well except me. 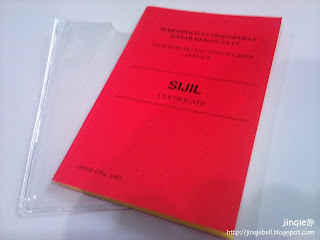 Will go for blood donation next year again. :D or maybe after 3 months, who knows ?